Strategic Goods Movement Network Plan | Resource Systems Group, Inc. 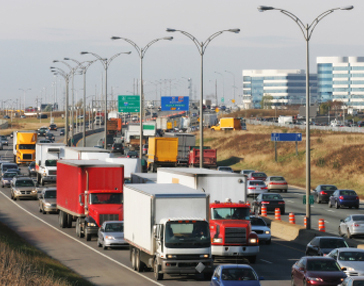 The fast-growing Region of Peel, Ontario, which includes some of the highest volume freeway segments in North America, sought to identify a strategic network of goods movement routes to support its logistics-based economy. The Region’s goal was to facilitate efficient, seamless connections across goods movement modes (e.g., truck, rail, air, water) and major economic activity hubs while also being sensitive to the quality of life needs of its 1.5 million residents. The RSG team created two network concepts informed by local input (solicited through interviews, meetings, and surveys with private and public stakeholders) as well as best practices from elsewhere and existing system conditions, regulations and plans. These concepts were then modified and finalized into a single network plan based on series of stakeholder workshops. Facilitated by the broad-based input underlying the study, the elected Regional Council adopted RSG’s recommendations for designating and implementing a network of primary goods movement roads and intermodal connectors that focused on enhancing freight mobility while preserving economic growth and resident quality of life.